Ruth stepped out of the box after strike one, then stepped out again after strike two. Tired of being heckled, he pointed two fingers, which is where the controversy begins. In the legend, he was pointing to the center-field seats, four-hundred-plus feet away, calling his shot in the way of Minnesota Fats saying, “Eight ball, corner pocket.” Root’s third pitch was a curve—the deuce. Off the edge of plate, down, but Ruth swung anyway, sending it into deep afternoon. It landed exactly where he’d pointed, that’s what they said, beside the flagpole in back of the bleachers—490 feet from home. Lou Gehrig followed with another home run. The Yankees won 7 to 5 and went on to sweep the Series. Ruth’s “Called Shot” is among the most famous plays in baseball history. 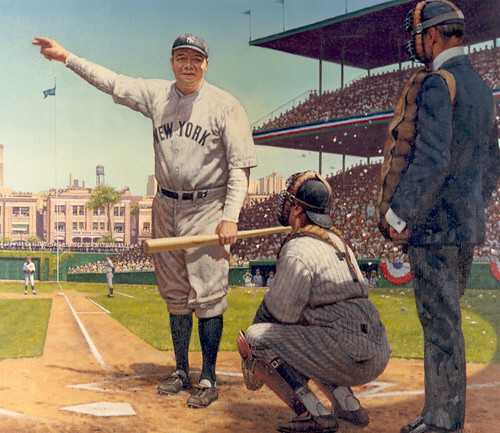 Drawings show the penultimate moment: Babe, Bambino, the Sultan of Swat, arm outstretched, two fingers raised like the Pope giving a benediction. There’s a statue, movies. But it was disputed from the start. Did Ruth really call his shot, or did it just look that way? As we beckon to the bleachers, we might recall that it was on this date in 1911 that Ty Cobb was awarded the Chalmers Prize (an automobile), the equivalent of today’s MVP Award. The “Georgia Peach” had achieved aa 40-game hitting streak and a .420 batting average, the highest in the league and record for the time; he led the league that year in numerous other categories as well, including 248 hits, 147 runs scored, 127 RBI, 83 stolen bases, 47 doubles, 24 triples and a .621 slugging percentage. 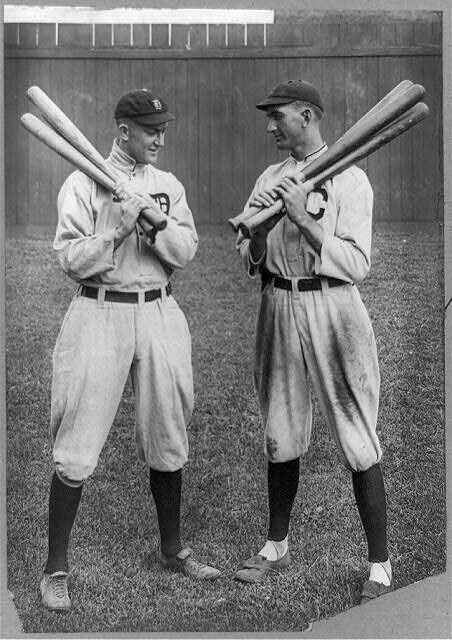 Cobb hit eight home runs but finished second in that category to Frank Baker, who hit eleven.